Do you have what it takes to be a Sales Manager at Europe’s Largest Health & Fitness Operator? At David Lloyd our Sales Managers are the ambassadors of our business and we are on the hunt for Sales Managers who can inspire a team of sales consultants to influence our prospects to improve their life styles. The role is all about hitting targets, making the most of your relationship building skills, to help you grow a pipe line of new prospects, to increase sales revenue and new member count. You will have the platform to take control and create your own success story, through David Lloyd’s challenger method of selling. To be successful in this role you will have a strong work ethic, be solution orientated, proactive and flexible, whilst maintaining a structured approach. You will also need to commit to mentoring, developing and coaching your team, as they will be key to your success. You will be expected to lead by example, ensuring your team sells with integrity and the role will require you to be hands on as you will have your own individual target to achieve as well as driving your sales consultants to achieve and exceed the expected results. The role will also require you to operate as part of the wider leadership team. So if you have experience of managing and developing a team, are tenacious with a competitive nature, have copious amounts of self motivation, drive and determination then this could be the ideal opportunity for you! 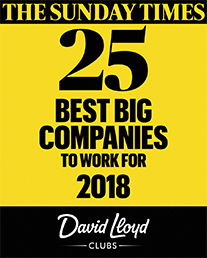 You would be joining Europe’s Largest Health & Fitness Operator and a we are thrilled to be ranked as one of the Sunday Times 25 Best Big Companies to Work for 2018! We aim to provide an enjoyable, fun and progressive culture where our ‘values; We Play, Freedom to Succeed, Edge, Will to Win, Passion to Serve and Thank you are brought to life each and every day. Opportunity to progress your career with David Lloyd. We offer a number of internal training programs and apprenticeship opportunities to help you get to the next level of your career. Discounted in Club products, including food and beverage, PT sessions, junior swimming and tennis lessons.